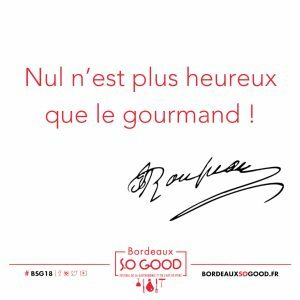 Vatel Bordeaux will participate to the 5th edition of Bordeaux S.O Good (16th-18th november) at the ‘Halles de Bacalan’. Vatel Bordeaux will occupy in part H14 stand, proposing a draw lot contest with the possibility to win a ‘Food & Wine perfect pairing’. ‘Les Tables Vatel’ welcomes you to join ‘Le Banquet du Potager’, their interpretation of ‘La Nuit des Banquets’. With a goal of giving a creative twist to traditional ‘terroir’ products in combination with a specific local wine selection. Les Tables Vatel chef Adrien Ferran will lead the evening alongside Francois Doat, sous-chef of ‘Relais & chateau la Bastide’, and Hasnaâ Ferreira chocolatier artisan master. Bringing a variety of vegetables directly from their ’Potager’garden, they will be assisted by a handful of Vatel Bordeaux students helping with this night’s service. We are looking forward to see you this weekend in this wonderful festival.